Several people are working on putting together original driveshaft information for 67-69 Camaros. Items of most interest at this point are below. Post in this thread if you want. If you would rather not post, but still contribute, send an email to me please. Thanks. You might find these helpful if you havenn't seen them already. 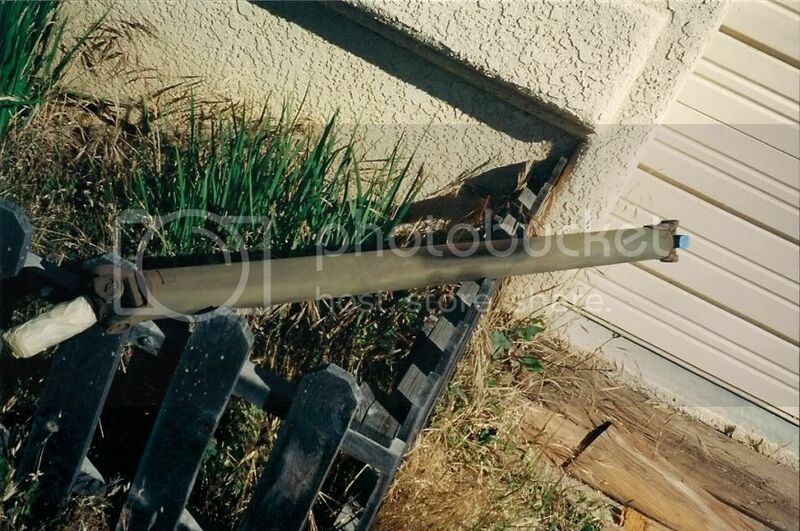 The original driveshaft in my my 69 RS, which I have owned since Nov 1991, 01C build date, had the driveshaft yokes offset one from another when I purchased the car. In July 1992 I had the driveshaft modified so as to put the yokes in phase. The original engine was not in my car when I acquired it in Nov 1991, but it was most likely a 307. The car has the original 2 speed Powerglide automatic and the original 2.73:1 open rear end. Pinion yoke, as I recall, is attached with straps. I also have a spare driveshaft that I personally removed from a 69 Camaro that was being parted out in March 1994. This car was a base coupe with a 327, built around the 3rd week of November 68 (VIN# 124379N551248, engine code V1122FJ). Note: This engine now resides in my car. Not the original, but at least I do have a '69 Camaro engine in my ride. This parts car had a 3 speed manual, not sure about the rear end - undoubtedly a 10 bolt open but ratio is unknown. Yokes on the driveshaft are offset as well. Thanks for those links. I had read most of them previously. The offset question is probably not one that can be easily answered, but I thought I would ask people who had originals to try to figure this out. Maybe I should just take this one step at a time, but I figured if people were going to take the time to look at what they had it might be easiest to just get all the iinformation at once. So for now...what I think I have figured out is the following for lengths. This is from AMA specs and some other Chevrolet sources. For 67 and 68 cars with the 396, different frame mounts for the engine were used which pulled the engine forward about 1/2 to 3/4 inch. Also note the holes for the 396 crossmember for use with a manual transmission had the transmission mounting holes about 3/4 inch forward. The PG, TH350, 3 speed manual and 4 speed manual transmissions are all close to 27 5/8 or 27 3/4 inches long (including bellhousing length). But the TH400 is slightly longer - around 28 1/4 inches. 67 and 68 Camaros used two different lengths. 49.96 inches for all applications except the 396 with manual trans which was 50.46 inches. 69 Camaros all used the same length, 49.56 inches. This appears to be due to the frame mounts all being the same for the big blocks and small blocks. Although I can't find anything listed, it seems the TH400 driveshaft should be slightly shorter. So that is why I am looking for actual measurements, to confirm these numbers. If anyone has different information, please post it and list your source. 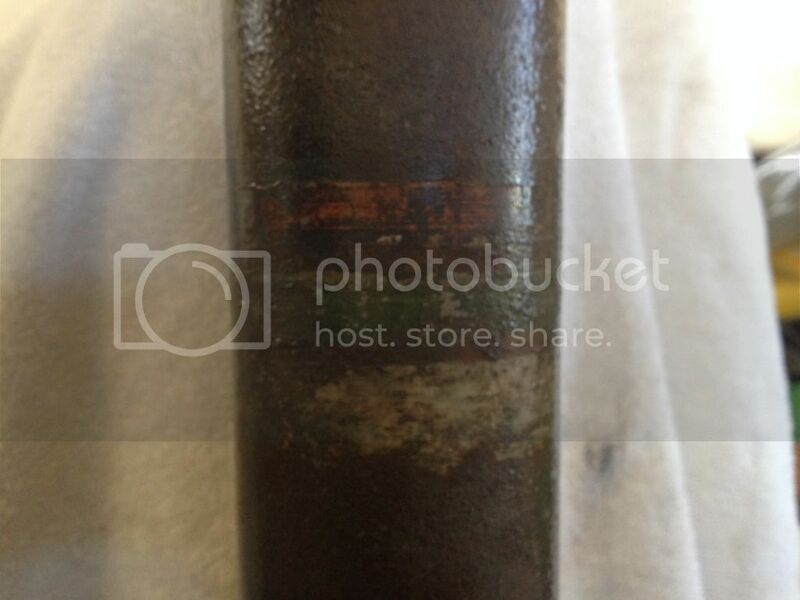 Is ANYBODY out there willing to measure your original driveshaft and provide that information? Especially interested in Big Block cars...manual trans or TH400. Thanks. You have perfect timing, that's right where I'm at with my restoration. My car is a '67 V8 Coupe, 11 A, Los Angeles built. Has the standard 327 - 2 bbl. engine with Powerglide trans.. The Driveshaft length is 50 in.. I have not found the Casting #( I assume it's on the end flange)(I haven't got that far cleaning) The Rear end tube Code reads: PW 0919 G. The paint stripes are Orange/White(I've included a pic.) And the U-joint flanges are Clocked. Let me know if you really need that Casting#.. I forgot to add it has U-bolts to attach the rear universal to the Rear-end input shaft. Paint stripes and a picture (if possible)- Picture of lime green looking paint stripes on trans. yoke. MyRed67 - sorry I could not find your name isted - thanks for that information. It goes along with what the length is supposed to be for 1967 Camaros with 6 cylinder and small block V8 - 49.96 inches. The information on the u bolts helps too. At this point, just started a database on the stripe colors. If you could, list the color of the stripes in order from front to back. I can't tell from the picture if the orange or white is toward the front. If you find the casting number, please post that too. Thanks. Chick, what car was that driveshaft from? Your 68 Z28? If so can you post the length from center of u joint to center of u joint. Thanks. I am going to post another picture I took of the Driveshaft with measurements, I am going to use this as a diagram to restore the Driveshaft back to original condition. I am attaching a pic. of the front Driveshaft Yoke straight on. If you can decipher the part # you're better than me. This is actually a pretty good pic., #'s are just real hard to decipher. I'm guessing, but are the last 3 #'s on bottom row part of date code? I don't know how they coded these yokes, but my Steering Gear Box was day 276. Don't suppose this helps much, but it's the best I can do. Mike, yes tough to read. Thanks anyway and good luck on your restoration. Yes, the drive shaft is off our 68 Z/28 and the length is 52 1/2". 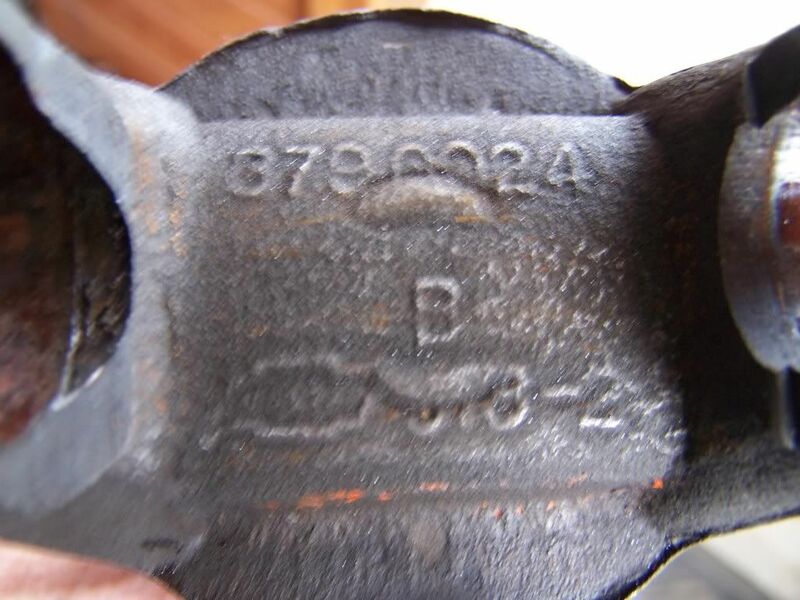 I found the part # on the yoke but its very difficult to read other than a couple numbers. 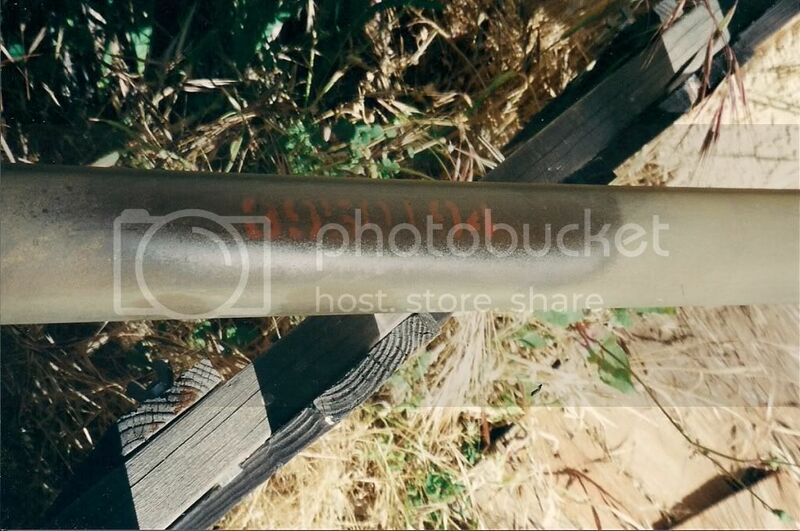 Actually this is a 1969 drive shaft is from a 69. 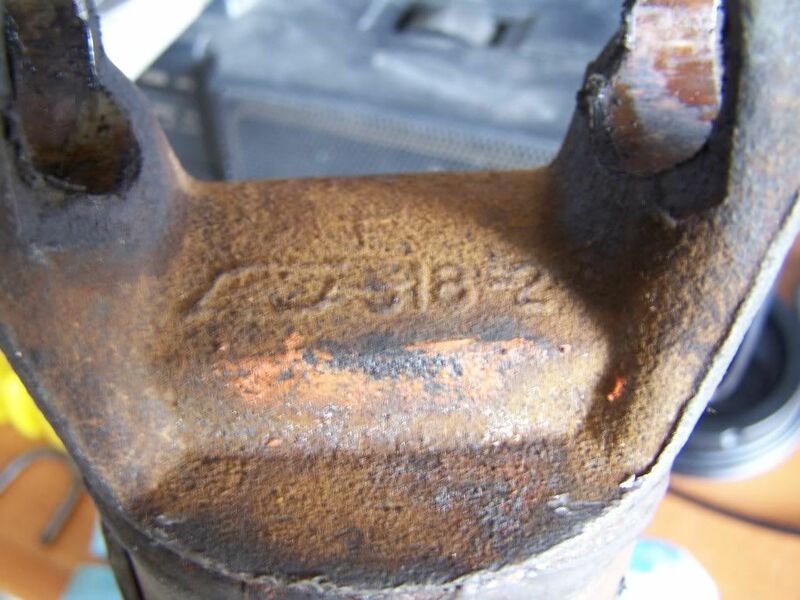 I doubt there's any date info there - the yoke is a forging, not a casting, and the Chevy bowtie emblem indicates that it was made at the Chevrolet-Detroit Forge Plant; the number next to the bowtie symbol relates to the forging die set used to produce the yoke, not a date. 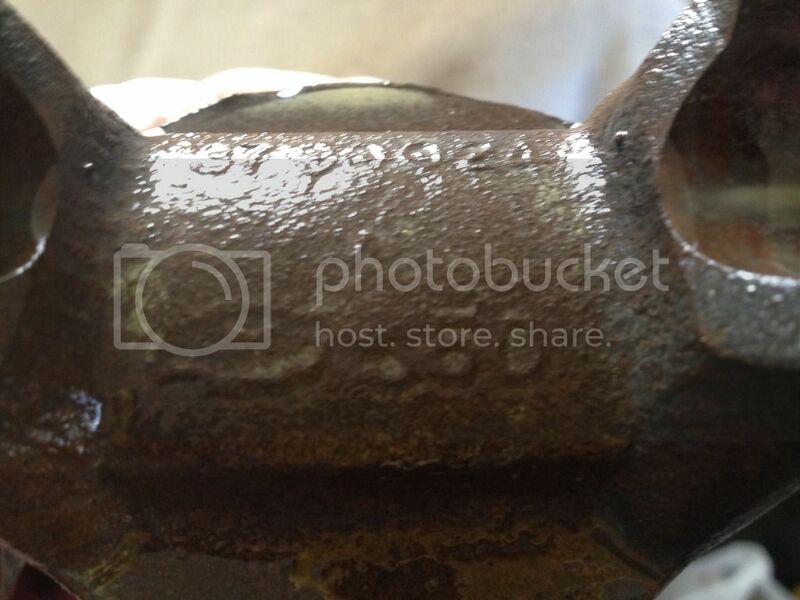 Forgings weren't dated, but they carried the forging number for the part. AMA specs for '68 state 50.46" c-c.
Has there been any definitive conclusion on the drive shaft strip color coding for the 1st Gen drive shafts, specifically the '69 Z28? The Muncie Transmission input shafts were different between the M20 versus the M21/M22 with the number of spine teeth. But were the output shaft splines the same on all three Muncies? If the output splines were different, did the draft shaft strip color codes reflect this? 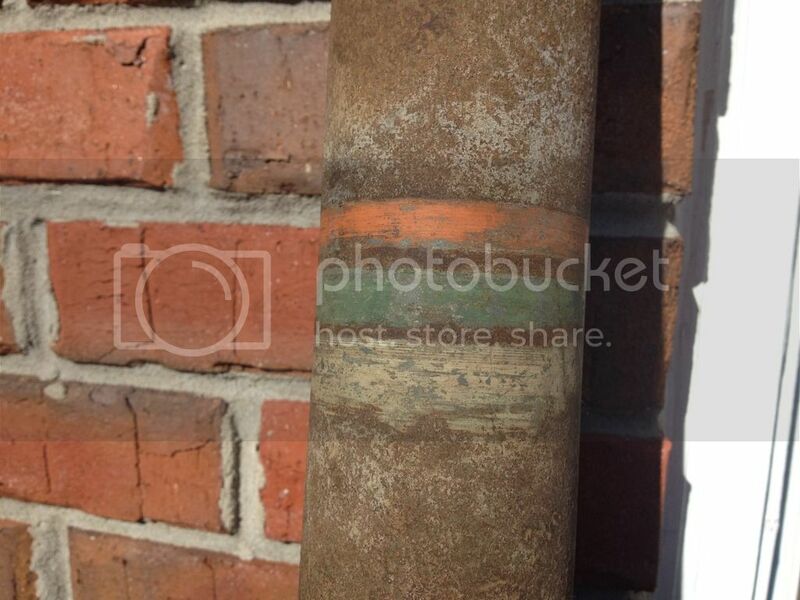 Based on the related links, it appears that the orange/white stripe combination has been found on 1st Gens. Thanks William! Bryon, the info I supplied was from what I believe to be a 69 Camaro auto. trans and not my 68 Z/28. What a mistake but I had the wrong drive shaft! The yoke on the one I reported on is larger and will not even fit in our M21. After William's comment I thought I better double check and yikes, screwed up on this one. Will report on the 68 Z shaft after I complete the intitial cleaning. Can tell you the yokes are offset and the length is approximately 50 1/2" in length. Chick, can you double check that measurement? I need the measurement from the center of one u joint to the center of the other. I believe it should be 49.96 inches for a 68 Z28. Thanks. The Muncie Transmission input shafts were different between the M20 versus the M21/M22 with the number of spine teeth. But were the output shaft splines the same on all three Muncies? Based on Corvette specs, all Muncies through 1970 had 10-spline input shafts and 27-spline output shafts; that changed to 26/32 in 1971. Dave we are still working on figuring out the driveshaft paint stripes. There were differerences, but so far we have not found anything written down. So we are looking at examples at this point. As John says, all output splines on 67-69 Muncies were the same. The large 32 spline output shaft did not start until sometime in the 1970 model year and used the 3978764 tailhousing. I could be wrong but I think those are the AMA specs for use with the 396 engine with manual transmission. I show 49.96 for all L6 and small block engines. Kurt S., Ed B. and I have gone through all of the parts books and AMA specs and have come up with a list of numbers. I don't think we are quite ready to put those out there just yet. 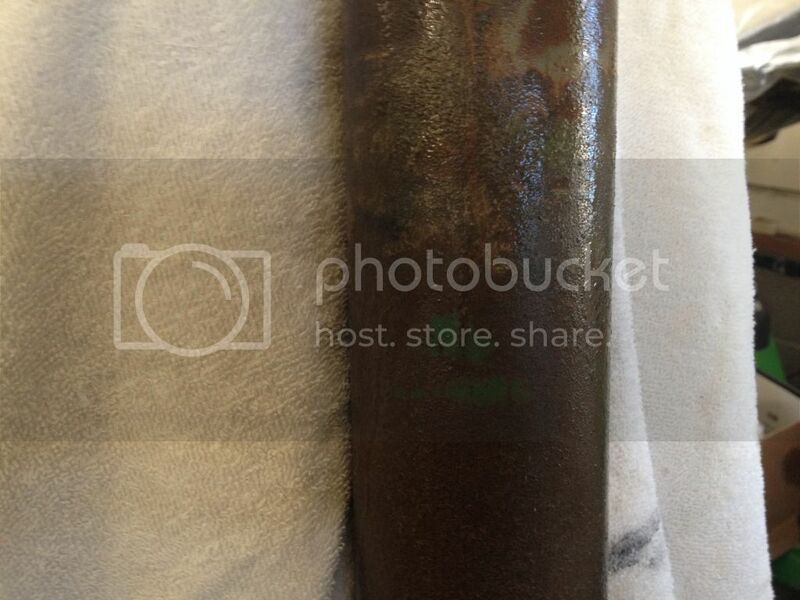 The point of this thread is to find the lengths of ORIGINAL driveshafts to confirm what we have found so far. If anyone has an ORIGINAL driveshaft and would be willing to share information it will be greatly appreciated. 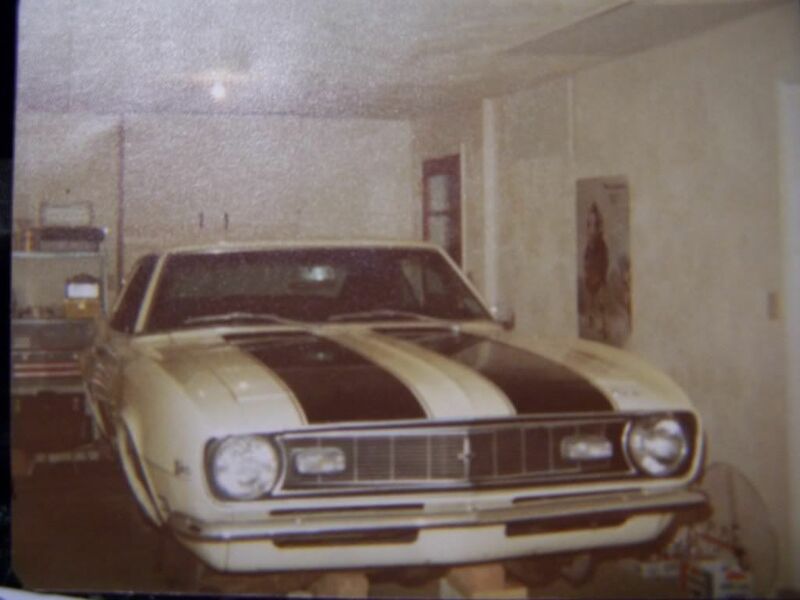 Original 1968 Z28, Norwood, 07C, 50 inches (or darn close), staggered yoke alignment, orange and white stripes (13 inches from centerline of yoke to center between the two stripes), attachment looks like u-bolts that are flattened where they go around the u-joint. Thanks for that information Jerry. I believe the 50 inches (49.96) and u-bolts are correct. 1969 RS/SS Convert., built in Norwood 11D (1968), L48 engine (350 - 300 HP), M38 Trans. 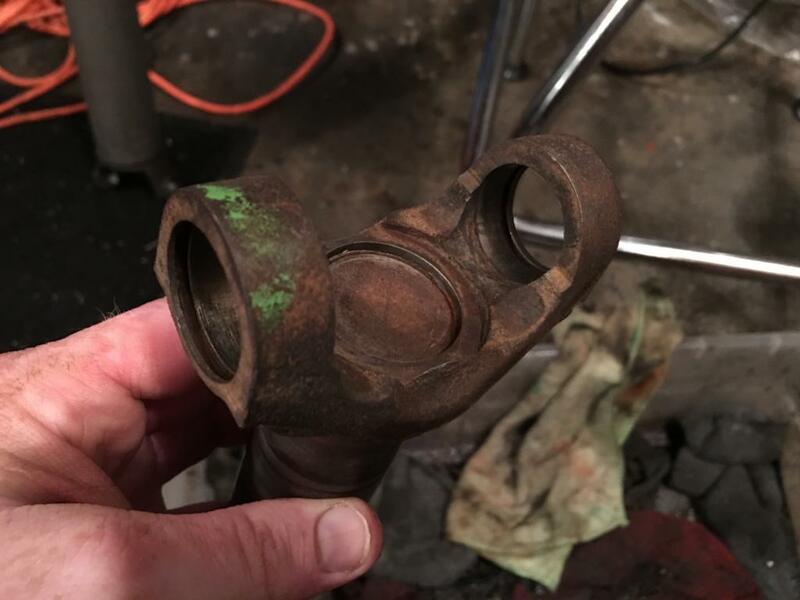 (Turbo 350), BR rear axle (3.07 12 bolt Posi) all original drivetrain. Driveshaft is approx. 49.5 inches c/c, clocked about 30 degrees, attached with straps to the pinion flange. Has 2 stripes, but color is gone, only discoloration remains. Thanks for all of that information Boston14. Exact length from 1969 AMA information says 49.56 inches. So yours appears correct. Thanks again. Anybody out there have an original 396 car with original driveshaft? strap and bolts-Type of attachment to pinion yoke. There are two types: U bolts and the strap and bolts method. 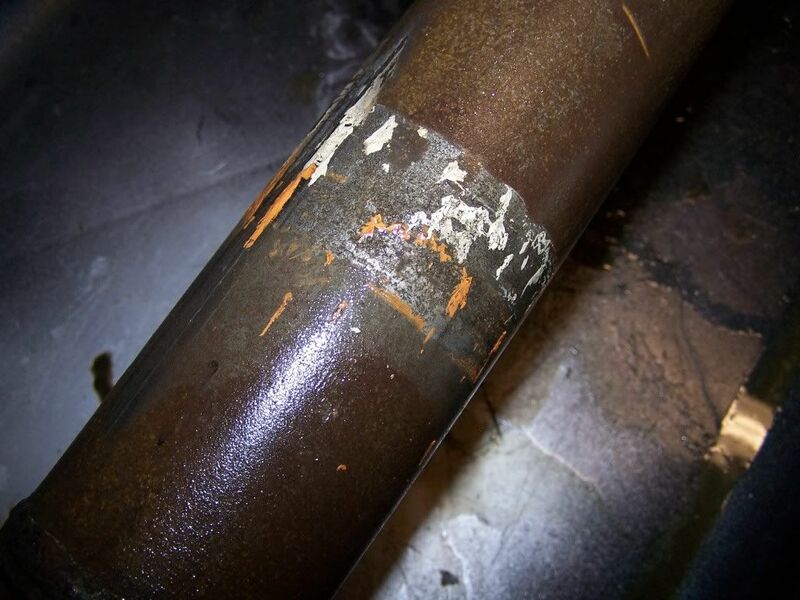 BS 1118 G2- Code stamped on front of passenger side axle tube. strap and bolts-Type of attachment to pinion yoke. BE 0610 G2- Code stamped on front of passenger side axle tube. in-line-Position of the u-joint flanges on each end are in line. will forward pics later showing stripe placement and u-joint offset. The most important question to be answered in any of this discussion (at least for 1969 IMO) is why the vast majority of driveshafts had offset u-joints and yet some of the more powerful engine / transmission options had the u-joints in phase. From a pureley mechanical engineering perspective, in phase u-joints are correct. In phase u-joints will theoretically maintain the same anglular relationship with respect to the horizontal at both ends of the driveshaft. If everything else works as designed, maintaining this constant angualr relationship will negate the constantaly changing angular velocity at one end of the driveshafti vs. the opposite end. 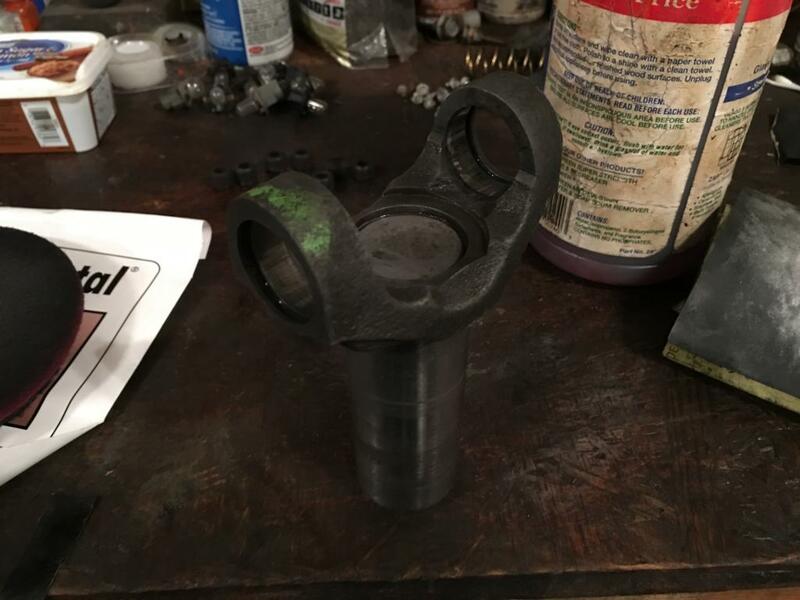 Out of phase u-joints, by definition, will not maintaitn the same angular relationship at both ends of the driveshaft......why GM / Chevy did this is one of the great mysteries of life. Rich I appreciate your input - but that is not why I started this thread. That question has been tossed around for years and years. As for WHY?, I don't think we will ever find an answer to that question. 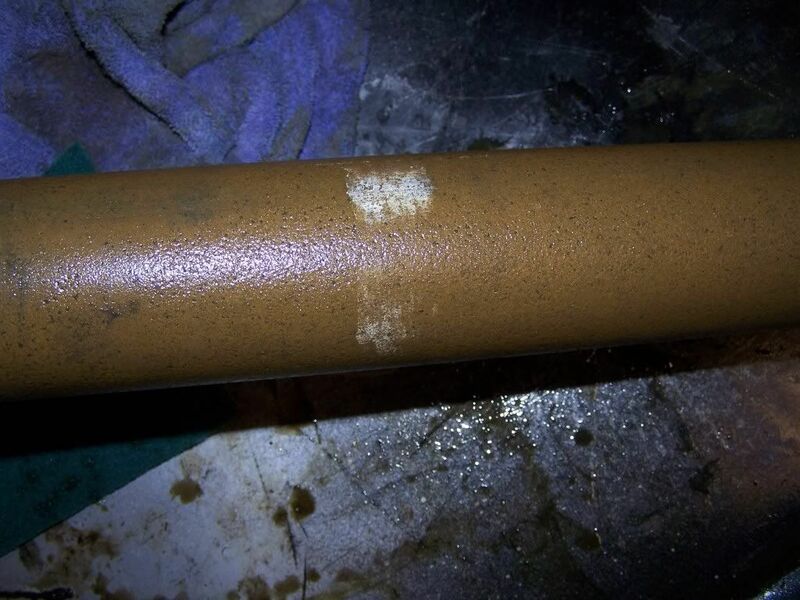 Found two white paint marks when the other end of the driveshaft was soaked. The dimension (tape measure in pic) was from the centerline of the rear universal. Both welded on Yokes are part # 3790024 and both seem to have a "318-2" beside the castings chevrolet embossed emblem. Notice the orange paint also. OK, I need to clarfiy something. The number that are on the yokes are not casting numbers, those are forging numbers. From what I have been able to find out so far, they are not Camaro specific, so they may not be of much use in this research. But thanks for all of the information so far. Any PLEASE keep posting! Especially any 67 or 68 big block cars. My axle isn't original to the car but is correctly dated to the 05D build. Also note that there's some kind of writing in yellow (see 2nd picture below). I can't make out anything but an "M" so I have no idea if it's original or not, or what it says. Thanks Ed. It does look like white and orange stripes to me. Sorry, wasn't able to help with the color bands. As you can see it was painted over. Any original 67 or 68 big block TH400 cars out there??? Anybody else want to post - please. 49.50" with 30 degree on the U-joints. What looks like a white stripe at 13.5", couldn't make out an orange one. I looked at one yesterday. 49.5 inches center of u joint to center of u joint. car that he junked out after it was wrecked about 30 years ago. It had what appeared to be an original TH400 yoke on it. The u joints were in line. I could not find any stripes on it. Thanks Rob. That would be awesome. Ok, got my drive shaft out and can report some preliminaries. Bolted straps on diff yoke. But....seemingly not original as the u-joints are pinned, not 'C' clipped or snap ringed?? But....pins are OEM only?, replacement uni's are furnished with 'C' clips? If so, then where the heck did this shaft come from?? Bolt straps on diff. yoke. No visible paint strips but would like to clean to see if there are any. 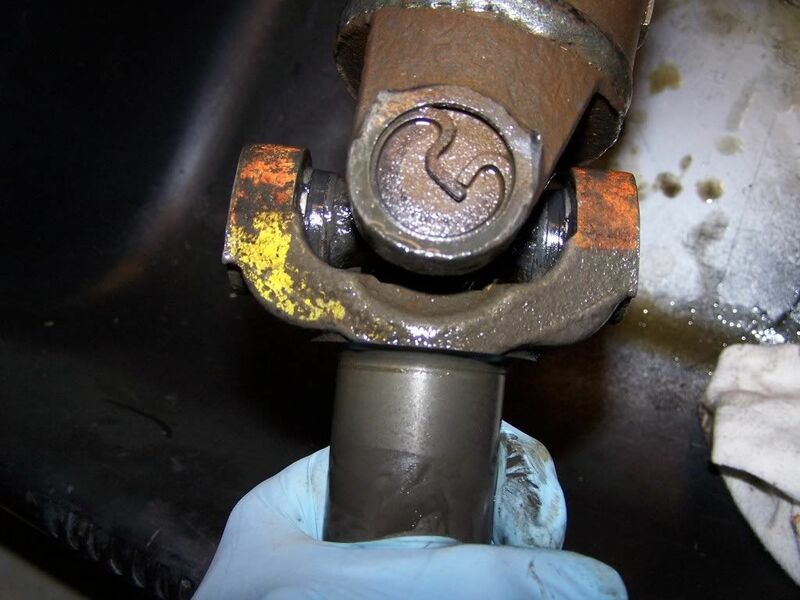 What are you cleaning your driveshafts with and will it affect my original joints? Wow, yours is pin injected as well !!! Are the pins orange in color? Maybe mine is original after all and still with the factory u-joints. I haven't noticed any stripes on mine as yet either, but I do have to clean off a thin layer of flat black which I had sprayed over the front half of the shaft many years ago. Bob, do you know if that shaft was from a TH400 BB car? Yes the pins are orange. Yes the shaft is from a 68 BB TH400 that I bought brand new in 68. Excellent, thanks Bob, I'm v. happy now! Bryon, will post more details and pics this weekend. It's winter here [Au.] , freezing cold and gets dark early. I just can't get home quick enough atm to do much. Thanks Rob and Bob. Yes, it appears that a length of 49.96 inches is correct for 67 and 68 big block cars with TH400. I can not say for sure, but the u joints you have are probably original. Anyone else with a 67 or 68 big block car and manual transmission with an original driveshaft who would like to share driveshaft info ? My spare driveshaft - donated from a car parted out a long time ago. Thanks Richard. Yes, tough to tell on the colors. 49.56 inches does appear original for your application. Sorry, not a big block but more information can't hurt. Will a 1969 camaro driveshaft fit 1967 to 1969 firebirds ? Length apparently for Firebirds 67-69 was 49.96 for all except TH400 cars which were 49.30 inches. 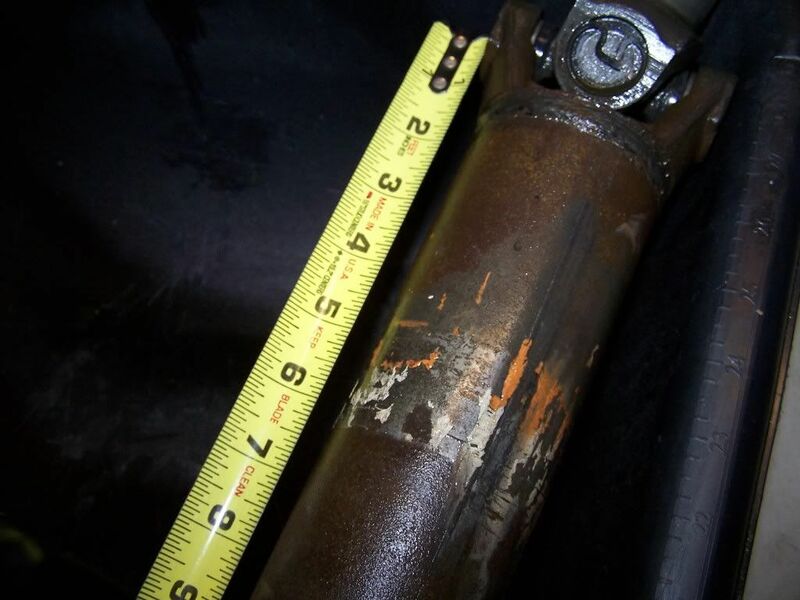 All 69 Camaro driveshafts were 49.56 inches. It may fit. You will just have to try it and see. I am going to go out on a limb and assume you meant 49.5 inches and not 46.5 inches. I look forward to the pics of the stripes. Thanks. Engine, trans and build as per my sig. Hi Bryon, sorry for my absence. More info to report. Have found the orange paint stripe on mine @ 12" approx from the transmission yoke center and what appears to be the green stripe a bit further down - more cleaning needed for that one. Thanks Rob. Check the picture above that Charley posted. You may have more than 2 stripes. I have a early 69 396 with TH 400, built 1st week in November.Norwood car. All drivetrain original 63K. Drive shaft overall center to center 49 1/4"
U-joints in line. E-clips on caps. Orange stripe 17 1/4" from front, then maybe light blue or green, then dark blue. Hard to tell I'll post pictures. I am surprised at all the variations. NoYenko - thanks for posting those pictures! plumL78 - if you could check that measurement for sure, I would appreciate it. Thanks. Here are some pics of my 69 Z28, LA built, 02C, M20, 49.5 inches, rear strap, BU 0117 G2, clocked 30 degrees, orange and white stripes with a purple splash closer to the yoke, Also shows some orange on yoke. 1968 z28 , norwood, 03c, 302, muncie m20, 49.96 length, ubolt and nut design, bu-0214-g1 axle stamp, 2 strips about 12 down from top, staggered alignment. Are the stripes white and orange? The strips are so faint, the look white to me. thanks. 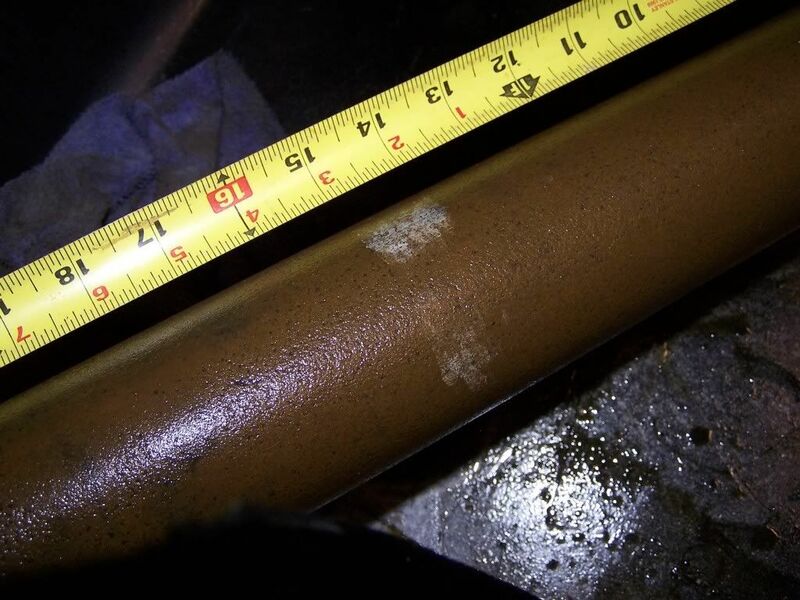 I think that I know why there is a 1/2 inch difference in driveshaft lengths between the '67-68 and '69 driveshafts but want info to verify. I believe it is because there is a difference in lengths of the transmission yokes being used for these years. Can anyone measure their transmission yokes from center of u-joint to end of yoke and report their findings. Be sure to include what year yours is. They should measure either 4.875 inches or 5.5 inches. My '69 L48 is 5.5 inches. I thought when we rebuilt the driveshaft it was the wrong one but checking another for verification it was correct. My driveshaft is also clocked and that brought on a bunch of weird looks and a big discussion at the shop until the post about the drivehsafts come up. So I am guessing that your driveshaft measures approximately 49.5 inches long. If you had a driveshaft that measures closer to 50.0 inches long I would guess the transmission yoke to measure 4.875 inches long. I just joined so Im new to this forum. I do have a 67 convertible camaro origianlly with a 6cy. and a 50" driveline on a PG. I removed the PG and engine for a TH400 and a 454. The driveline fit but it has NO room for movement. The Th400 has 31 splines i believe. I need approx 1/2 to 3/4 inch more room. Im going to order it from "Inland Empire Driveline" and go pick it up as i live in OC. They have a website with all the pertinent info to order a correct one. Looks like they come with 1310 Spicers. FRom what I gather, the big block sits back a little and thus I need a shorter driveline. I will ask the guys tomorrow and just order it new, as I dont want any problems from not having enough room for movement, however, I do believe the original big block 49.5" would have worked. The one I currently have is 50" from center of U-joints. This forum helped me get my measurements correct. 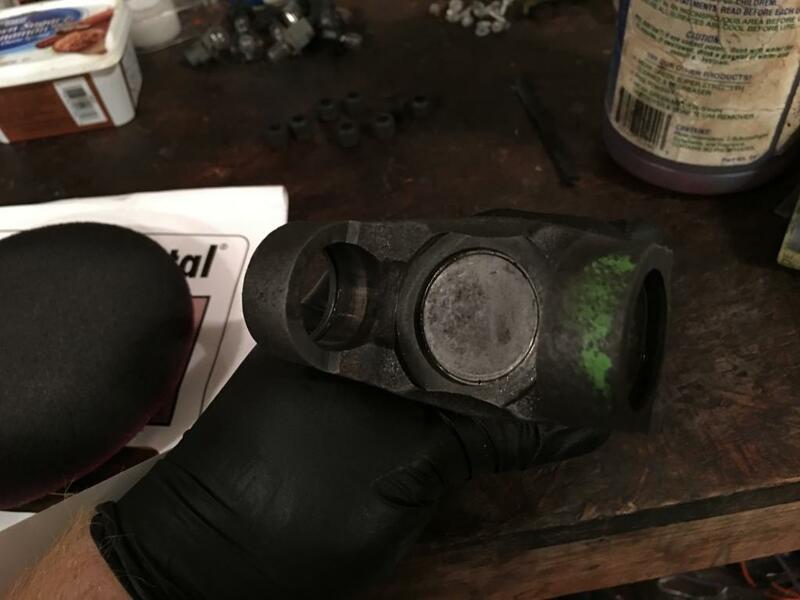 Before you order the new shaft, check your motor mounts. I think there were different mounts for small block, big block, and 6 cyls. I am told you can move the engine forward or backward a little bit by using different mounts. Might be worth a little time. For 67 and 68 cars with the 396, different frame mounts for the engine were used which pulled the engine forward about 1/2 to 3/4 inch. Also note the holes for the 396 cross member for use with a manual transmission had the transmission mounting holes about 3/4 inch forward. The PG, TH350, 3 speed manual and 4 speed manual transmissions are all close to 27 5/8 or 27 3/4 inches long (including bellhousing length). But the TH400 is slightly longer - around 28 1/4 inches. So that is why I am looking for actual measurements, to confirm these numbers. I have original unrestored drive shaft, The car is 67 04A norwood convertible, 250 engine 3 speed manual trans, measurement form u joint to u joint is 50". Thanks, Bryon/Gary I may try this. 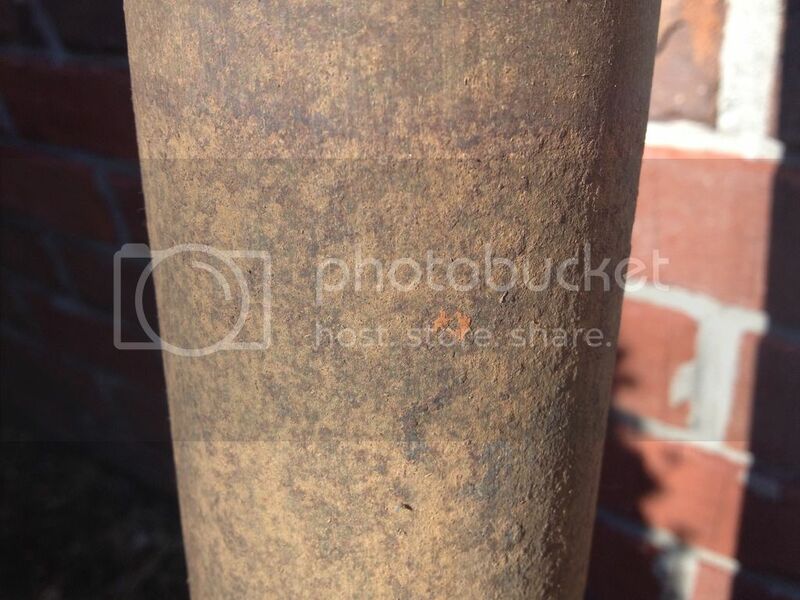 Shaft has surface rust and I thought it was too far gone as far as ever finding paint, but worth a try, I guess. I do believe the original U joints are still in the shaft though. They have a dimple aprox.1/2 in, diam on each side with a letter in the bottom...kinda hard to see at this point. There are clips on the ends like snap rings. Transmission Saginaw M20 4 spd. Type of attachment to pinion yoke. U-Bolts. James - thanks for the data! Thanks Eldon, yes please post any additional information when you have a chance. This is the information for my 1969 Camaro that I bought out of Phoenix Arizona in the 1990s. It shows 25,000 miles and is still very original. BR 3.07 Posi Has 3.73 gears now. 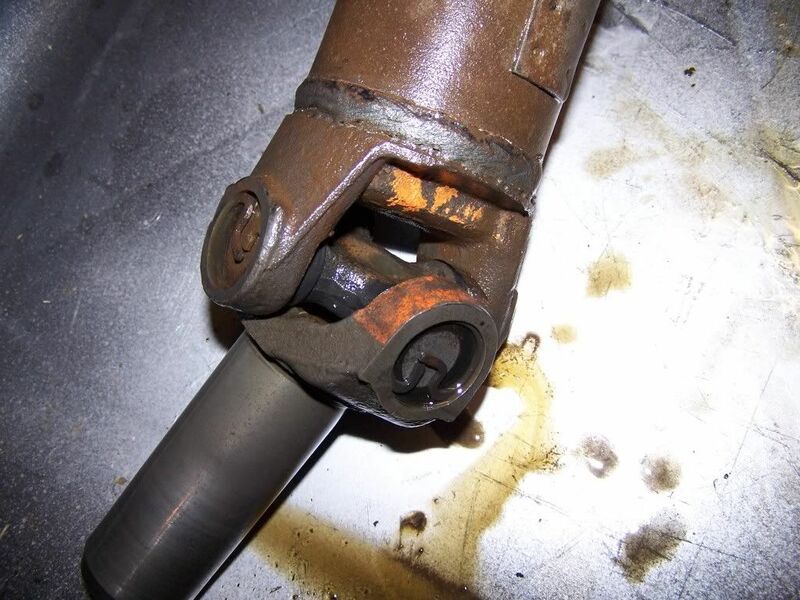 We are getting close to working on a report for driveshafts. I may be contacting some of you soon to see if I can get your permission to use some of your photos. If anyone has any more data to share it would be appreciated. Specifically requesting any pics of the stripes on driveshafts from TH350 cars right now. I finally got around to crawling under the 67 to find this info. Hopefully it is helpful. 1967 Camaro RS/SS 396 BB with 400 TH auto. Code on rear axle is Q W 0 ? 0 7 G 1 (the 4th digit is hidden behind axle clamp, I wasn't going to move it) It seems that these numbers were more left on the axle than in the place that is stated in the pictures. I had a hard time finding it till I looked and wire brushed it more to the left. I found 2 paint stripes on the shaft, From the front to the rear appears to be orange and the rear possibly green? but i am somewhat colorblind in that color! Spaced about 6 inches apart and about an inch wide, more near the front. position of the u joint flanges are "inline". Thanks Darrell. I think there should be a third stripe. Hard to see, but might be there? Orange stripe and possibly a white stripe. Any chance there could be more than 2 stripes? Thank You Gary! Sorry, I guess I must have forgotten to reply to this earlier. Merry Christmas! Glad the driveshaft turned out good. Looks likes only two stripes but it's real hard to tell for sure. I can try to post some pics for you. No problem. I have been called a lot worse. Just recently at the MCACN show I had lunch with one of my Cleveland Chevelle car buddies and his friend. In talking with them I found out they both worked at the Chevrolet plant in Parma Ohio back in the mid to late 60's. My buddy is about 68 ish now. They said they were both involved with drive shaft's and balancing, they made shafts for more than several Chevrolets'. I specifically ask if they knew anything about the strips, they explained that when doing the code stripes, and while the shaft was still in the ballancing fixture, the guy might hold several paint brushes at a time while the shaft turned in the fixture. So the one reason to post all this, they both indicated to me that one the the 3 strips was a shift code. If it was consistent, who knows ? And if not, that may explain why you'll see only two stipes at times. Finally got a picture of my driveshaft. Here's the driveshaft out of my 69 Z.
I wanted to add a little more info while doing the de-rusting process. 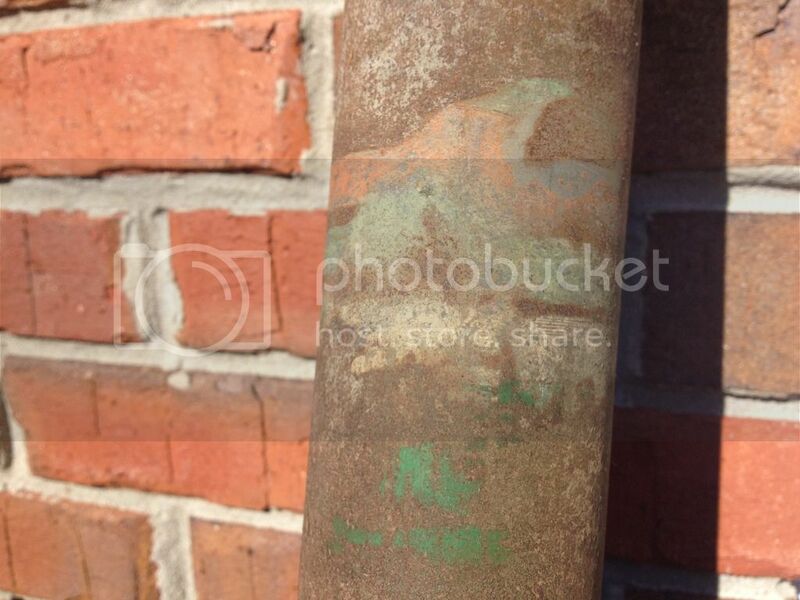 Some type of green dab of paint below the stipes. Will know more once rust conversion is finished. Still soaking but I am starting to see the paint stripes better and better.. Also looks like whoever it was doing the painting grabbed it while it was still wet. Thanks Darrell. I was expecting three stripes for an L78. What is the functional difference in BB (L78?) and SB driveshafts?? Length is the only thing I am aware of.. I assume the striping could be for the passing of RPM tests..??.. Bryon may know more..
OK. I wasn't aware of the length difference... So there's no strength/diameter/wall thickness difference? In the factory they needed a quick visual reference to help them grab the correct part for the car coming down the line, and the length being different would be sufficient to justify the striping difference. PS. I've never owned a big block... A mighty mouse is more than GOOD!.. but if a car part from a BB car can be used on a SB car, I'm interested.. I dont think its just striping for bb vs sb. auto bb's had a different stripping as well.. Would like to see a compiled list of data.. Come on Bryon!! Have been working on a driveshaft report for about 4 years. It's close to being ready for release. Length and yoke type are the main differences. You would be right Mr. Cook. That holds true in the Pontiac world and have seen a lot of those differences restoring Pontiacs. Transmission choice does have an effect on the striping colors and configurations. I'm sure Chevrolet does the same thing. I wanted to add this to the driveshaft info. Decided to derust the yoke last night. Found another nice paint marking.. Yes it does help! Thank You! Could you do one more thing please? Measure the length from the center of one u joint to the center of the other u joint. Having some help to hold one end would be best. Try to get the measurement to the closest 1/16th of an inch. Thank You Darrell. Good pics. That tape measure: Is that from the lip of the tube or center of yoke or ? I checked my pics.. the tape measure is from the lip of the tube. Its a Oct 69 build. If you could...please measure from the center of one u joint to the center of the other. 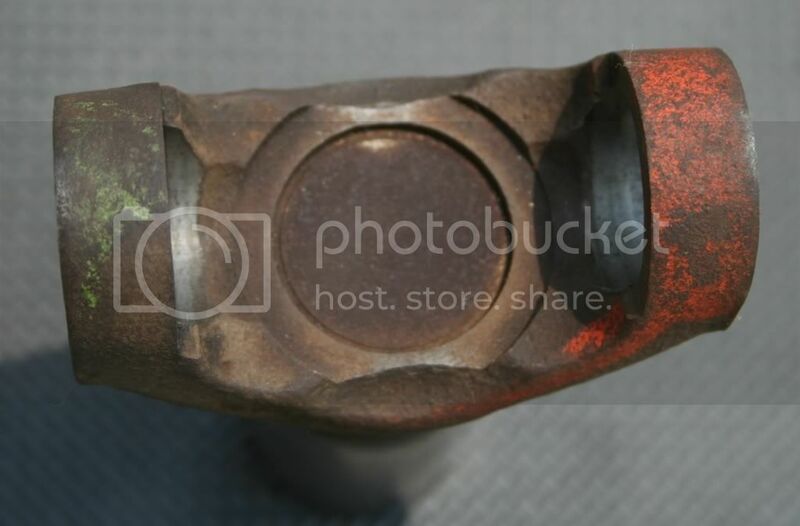 Another way of saying that is "the center of each cap or cup that holds the needle bearings for the u joint". Still soaking but I am starting to see the paint stripes better and better..
Looks good! Thanks for the pic! Would really like to have more data on any late 68 or 69 cars with the TH350 transmission. i can offer some info on my `69z, needs all the rubber replaced on the brake system so i`ll have all the wheels off it soon and will take some pics for you if needed. i can see the stripes on the driveshaft just looking under it so i know there is at least one visible. That would be great Eldon. It most likely has one orange and one white stripe, but if you could confirm, I would appreciate it. will do, I`m bringing it to the Street machine nationals this weekend in St.Paul Mn. so when the show is done sunday it`s time for the brake restoration. Eldon, did you have time to check your driveshaft? Does anyone have any info on the driveshaft for a 1967 L78 4K Camaro? Trying to verify mine. The question is why are the U-joints out-of-phase? The answer is for reducing vibrations. Graph the power through a single U-joint and a sine wave is drawn. The joint speeds up, positive arc, and slows down, negative arc. Add another U-joint and its power graph will have the same sine wave. Add the two sine waves, if they are in-phase on the same shaft, and amplitude doubles, meaning the resultant twist is noticeable. By offsetting one joint by 30°, decreases the amplitude of the associated twist, less vibration. Now, driveshaft's having been built forever, and 1st Gen driveshaft's are different from typical design, may be due to the extreme angularity of drivetrain design on Camaro, i.e., wheelbase, length of shaft, OD and wall thickness, and critical speed of driveshaft. What are the specs on the one you have? The aren’t all “clocked” or out if phase. The aren’'t all “clocked” or out if phase. True, I would think it depended upon application/options. Critical speed is important - it is rocket science. I have to disagree - that’s not how a double Cardan joint (U-joint) works. 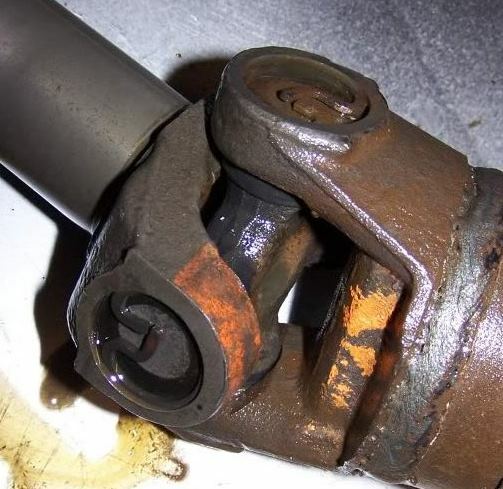 Refer to page 3, 3rd post of this thread and search : driveshaft, rich69rs for other posts where this has been discussed previously. I have my theory as to why Chevy did this - but since the forum hasn’t pursued the question seriously, I haven’t either. Of all the driveshafts built by all the auto makers, over all the years, ‘69 Camaro, SB, TH350, manual, and Powerglide got offset yokes, yet, as I recall BB w/TH400 transmissions didn’t??? As far as critical speeed (resonance) goes, offsetting the yokes will definitely stiffen the driveshaft and shift a natural frequency(cies) up - but at the expense of proper operation of a double u-joint system which is designed to keep the included angles of the driveshaft equal at all times. With offset yokes, the included angle between the differential and the driveshaft will be different at all times from the included angle between the driveshaft and the transmission. Stiffer driveshaft system? Undoubtedly. Ideal for loading on either the diff or tans? Not so much. I modified my driveshaft to in line yokes back in 1991. As you say, my theory also, anything is possible. 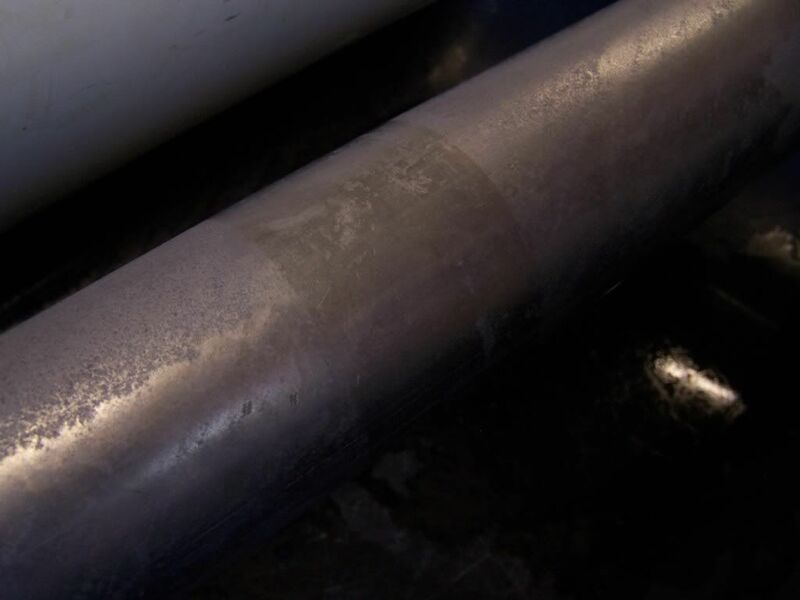 Critical speed is dependent upon OD, wall thickness, material, and length. Some of the Firebird Turbo 400 driveshafts also had inline yokes. I have one in my garage. My 68 maybe Z28 is an 07B and the shaft has yellow and white paint swabs. The yokes are in line. Thanks Chris, for Z28 I believe should be orange and white stripes. Faded orange can look like yellow. Can you get a measurement center of u joint to center of u joint? Thanks! 49.96 is the length for most 67 and 68 Driveshafts. The other one is too long for any stock 67-69 Camaro. Are you sure on your tube diameters or are you measuring the yoke? Just adding to the list of offset driveshaft end yokes. My 68 definitely had the offset U joints. Z28, M21 with a 4.88 rear ratio. Built late Dec 67 or early 68. Can't remember. 124378N3561xx. Complete report available here at the link below. Send me a private message, I would like to hear more about your car. 02D (1969). The driveshaft is not phased and the markings are Orange and Blue. 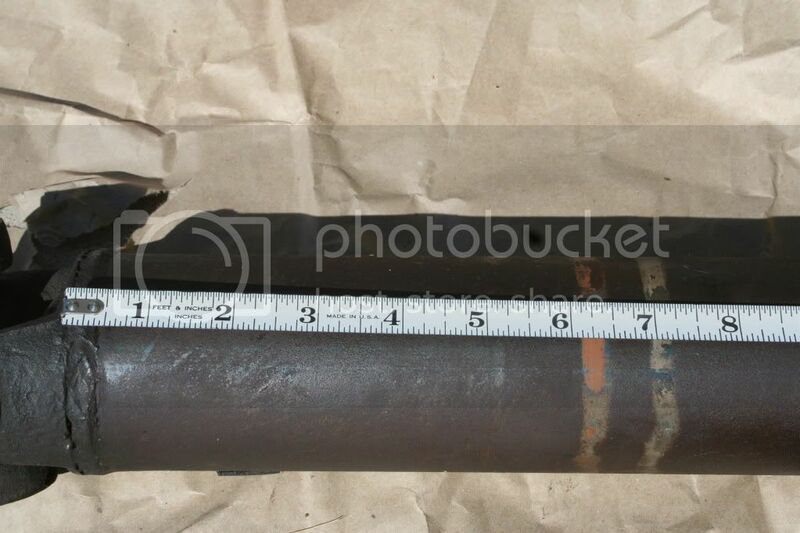 The driveshaft has never been removed from car and it is very low mileage. I'm sure of the color makings. It uses straps at the differential. Differential is positraction 4.10 ratio. I also have another original owner 1969 Camaro SS L48 with M20 transmission. The car is 11C (1968). 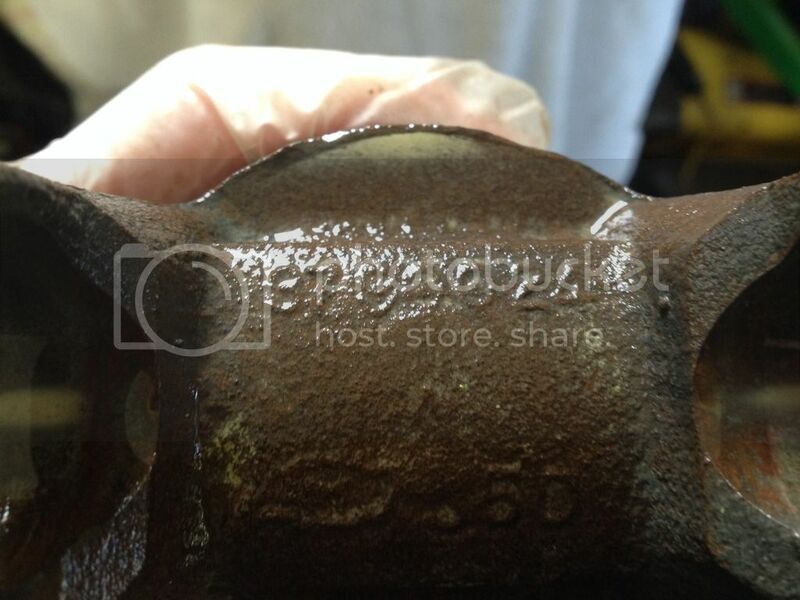 The driveshaft is phased and the markings are long gone. It uses straps at the differential. Original owner but high mileage. Differential is positraction 3.70 ratio. 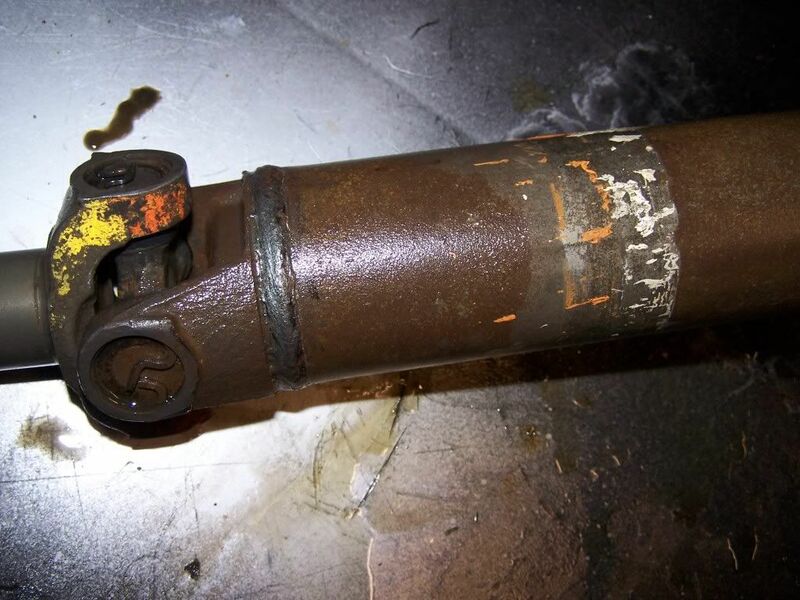 Can you post a pic of the 1969 L78 driveshaft? Or send it to me? Thanks Joe. Could you post any pics or send to me? 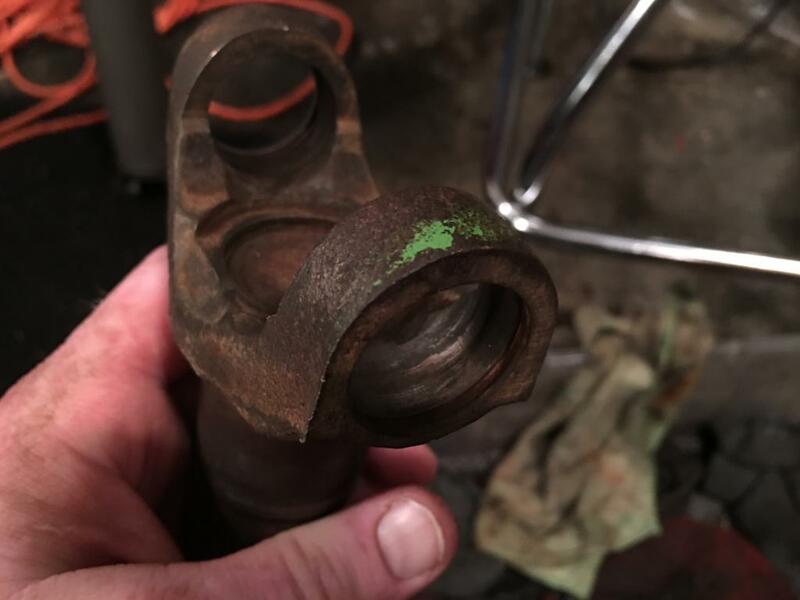 Question......my 67 LOS L35 w/TH400 has the original driveshaft with the nylon injected yoke and trunnions .....do you think that these can cause issues from age? I certainly think that is possible. I love originality but when choosing between that and safety, safety always wins. You could put it on the bench and do a careful inspection to see if anything is loose before replacing.